Recovering from a concussion typically takes 6 to 12 weeks, but with intensive daily rehabilitation, recovery can be accelerated. NeuroHealth’s NeuroReset program is a one-week rehab program for treatment of post-concussion syndrome, migraines, vertigo, pain, dizziness, and movement or balance disorders. Patients in our NeuroReset program have better outcomes than those who undergo traditional rehabilitation. Over the course of five days, patients have four appointments per day. Each day begins and ends with simple tests that allow us to gauge our patients’ progress. By the end of day five, most patients show considerable improvement. Rehabilitative therapy is progressive and incremental, with each treatment building upon previous treatments. When too much time elapses between treatments, patients may lose any gains they’ve made toward recovery. NeuroReset ensures that patients stay on-track during rehabilitation. Often, symptoms such as depression, personality changes, and inattention indicate that the brain’s neural network isn’t working effectively. NeuroHealth offers treatments that stimulate communication between the brain’s two hemispheres. Dizziness, vertigo, and poor balance may be indicative of a vestibular system disorder. The vestibular system – the inner ears and the brain – helps a body orient itself. When communication breaks down between the brain and inner ears, patients may experience a range of complications. 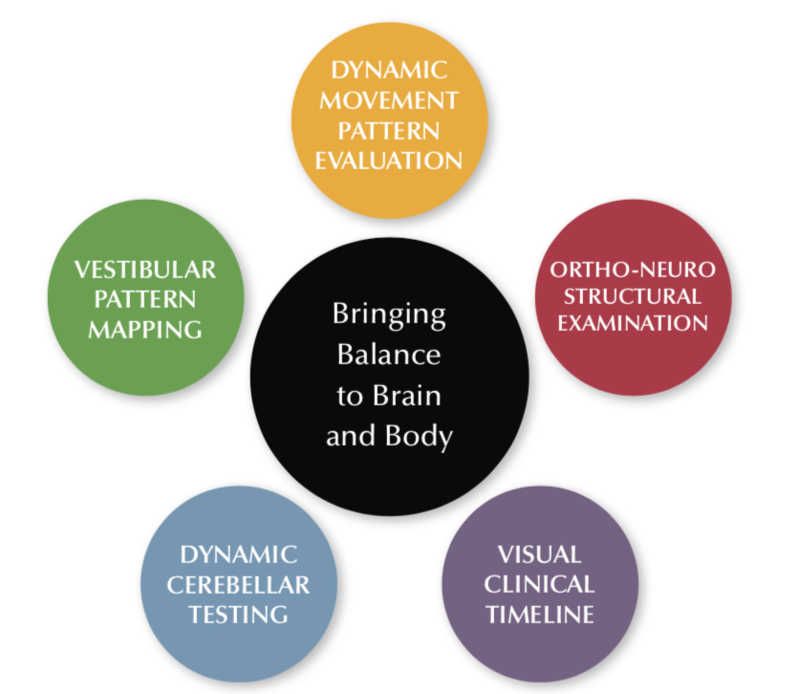 NeuroHealth uses sophisticated balance analysis equipment to diagnose vestibular disorders and a variety of cutting-edge procedures that restore healthy communication between the inner ears and the brain. Every system in the body is interconnected. When a part of the body isn’t functioning as it should, the effects may be felt elsewhere – for example, hip pain may be the result of an abnormal gait. NeuroHealth analyzes how the body moves. We then correct abnormalities using non-invasive procedures that include soft tissue mobilization, laser therapy, traction, and muscle stimulation. Disorders in the body’s neural network often cause specific eye movements. We use testing equipment to examine eye movement, and based on the results of those tests, we may recommend one or more therapies that target dysfunctional systems in the body and brain. The brain needs nutrients to function well, and certain medical conditions may deplete vital nutrients in the body, contributing to neural dysfunction. We analyze blood sugar (glucose), iron levels, and other factors to determine whether diet and nutrition modification might be necessary. Simple dietary changes can have a profound impact on overall health. Once diagnosed with a concussion (resulting from a car accident), I struggled to know what to do after the neurologist said it would take 6-9 month to recover. A simple internet search for “concussion care” led me to NeuroHealth Services. ​I was admittedly skeptical at the onset, but after less than one week of intensive brain training therapy my symptoms had noticeably decreased. After two weeks, I was convinced that I was in the right place. The work we’ve done is not an instant cure-all; however, the staff at NeuroHealth Services has helped me navigate this new normal. The human body is unique, and two people with the same condition may respond differently to types of rehabilitation and treatment.The NeuroReset program is not a substitute for regular medical care – our goal is to provide an alternative method of treatment that produces results quickly. ​Even when you have health insurance, the cost of medical care can be unpredictable. When you participate in the NeuroReset program, you’ll never have to worry about surprise medical bills arriving months after you’ve completed treatment. At your initial appointment, we’ll explain your total cost of treatment, and how to bill your insurance for reimbursement. NeuroHealth’s Dr. Brad Ralston and Dr. Lucas Gafken have years of experience in the field of functional neurology, and they continuously strive to increase their professional expertise by participating in seminars and training. If you’re ready to feel better, contact us today to schedule your initial consultation.